This past weekend, I had a chance to travel to Missouri, to the Factor-E Farm, home of the Open Source Ecology project. While you may already know about the project from the TED Talk presented by Marcin Jakubowski, some friends from the local ecology group and I wanted to go see the project in person. Not only would we get a tour, but also a chance to help out, as labor laying earthen bricks for a new permanent building. We packed seven people, plus camping gear, into an old work minivan, and hit the road. I can’t say comfort was at the fore-front, but our miles-per-gallon-per-person were pretty good. A Prius wouldn’t have held as many people, and a bus wouldn’t have gotten as good mileage. After many hours, and a gas stop, the sun had returned to above the horizon, and we were now in rural Missouri. We piled out of the van in a small town, only a few miles from the Open Source Ecology project. After stretching, we headed into the local cafe. I don’t think it got any more local than this place. It was obvious that everyone there knew each other. The dining room was a bit smoky. (We have a smoking ban in Wisconsin now, I had gotten used to that…) I can’t recall the name of the cafe, (Ted & Julie’s?) but it was the names of a husband and wife team. Sure enough, the name tag on the man taking our order matched the sign on the door. I do have to say that sleep deprivation is much more tolerable once I’ve had some coffee and biscuits and gravy. We decided to do introductions to each other at the breakfast table, as some of us knew each other, but others we had only met while stumbling in darkness into the van. We were a mixed group; college students, organic farmers, small-scale ethanol producer, eco-promoter, renewable energy enthusiasts, and electric vehicle builder. One of the locals came over to say hello. He was the local bank loan officer. “You folks headed over to Marcin’s?”. I think it must have been a rhetorical question. The town can’t get many visitors. We had a nice chat with the guy. He was a man who thought before he talked. (You don’t see much of that nowadays!) We asked his opinion on Marcin’s farm. Although a kind and thoughtful fellow, it was clear that some people don’t see the “big picture” of what this project really entails. Comments included “Why not just buy a USED tractor?” and “He can’t feed himself”. The locals just seemed to see an odd man guy with a quirky project, rather than a visionary who has a good chance of changing the world. Much building material was around, some new, some salvaged. 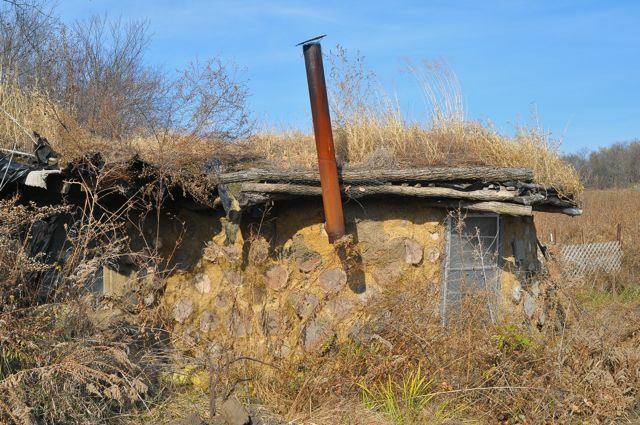 The two permanent buildings were a small building of cordwood and earthbags, and a workshop, which was a collage of earth-bricks, green roof, and used greenhouse glazing. The driveway looked a bit treacherous for a non-four-wheel-drive vehicle, but a second driveway looked a bit better. We got out and introduced ourselves. Two of the on-site workers were preparing mud slurry, and laying out lumber for the building interior walls. Marcin was operating a tractor, bringing pallets of pre-made (on location, with local materials) earthen bricks from the brick compactor to the concrete slab. We set up tents, as our plan was to spend the night camping on location. A few of us jumped in to help out with the labor right away. I tried (unsuccessfully) to see if I could sneak in a nap. We were also waiting on another group to arrive from the University of Illinois. That group was nearly all engineering students, but with at least nine different majors. I perused the property to see what had been done so far in terms of buildings and renewable energy. The first thing I noticed was that the whole place was off-grid. There wasn’t a single power line coming in from the road. Still, they had power, lights, and internet access. On the south side of the workshop was a fair-sized PV array. 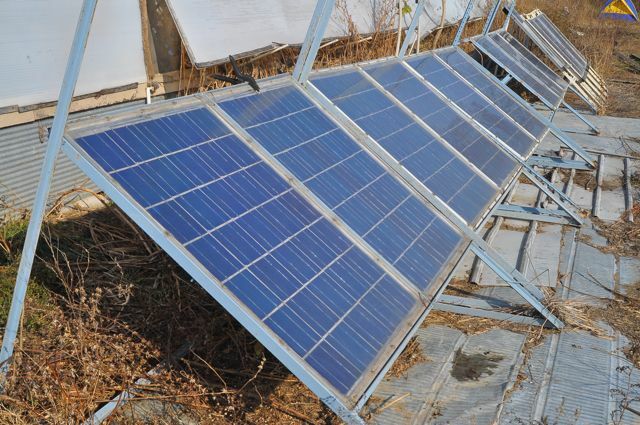 They all appeared to be recycled and/or salvaged, but with as simple and durable as solar panels are, that’s really not a problem. Inside the workshop there was a breakroom that also acted as the powerhouse. An industrial battery bank was insulated with thick EPS foam insulation. I didn’t confirm it later, but it looked like it was a repurposed electric forklift battery; it was about the right size and shape. When I was in there, there was also a generator running outside to power some construction equipment. While that was running, it also powered three 40 amp 12V battery chargers. A 36 volt system also screamed “yep, it’s from a forklift” to me. Also in the powerhouse were two dorm-sized refrigerators, and several salvaged/repurposed power inverters. Not far away was a shower with an on-demand electric water heater. The main portion of the workshop was dirt floor and natural lighting. It reminded me of an old-fashioned blacksmith’s workshop. Instead of bellows and forge, there were hydraulics, diesel engines, AC generator heads, and a DIY CNC cutting table. An unusual combination of the old and new, the natural and human-made worlds. Tools hung on nails on every available vertical foot of support posts. Further exploring lead me to find several tool sheds made from “Grain Bins” – cylindrical sheet metal buildings. A large arch was cut in each one to make the entrance. Not to be wasted, I noticed the cut out piece became a section of fencing between two of the buildings. The grain bin tool sheds housed a large modern lathe, a motorcycle, and other machinery. Around the corner lay a pair of “solar dorms”. This small wooden building was sort of the off-gridder’s motel. Two rooms, side-by-side, both had a simple door and a large window, facing south. Inside was a bed, some space for personal items, and not too much more. I spoke with one of the workers who was sitting there on lunch break. He told me how it’s fully insulated, and just the sun does a pretty good job keeping it warm. He also mentioned how the other guy’s was a little warmer. As he nodded to the next unit over, I noticed that it had a simple solar hot air collector built onto the front of it. Just up the hill from there, the Fab Lab was under construction. A large concrete slab had a roller belt coming right up to it. At the end of that was what looked like some sort of industrial trash compactor. But earth bricks were coming out of it at a rate of ten a minute. Just behind the Fab Lab, a tractor would scoop up dirt, and drop it in the compactor, which would create bricks automatically (it’s actually run by an Arduino!) and roll them out to the work site. Everything from materials to processing to use was within 100 feet of each other. In a country where the average meal travels 1500 miles, it’s amazing to see construction materials transportation measured in FEET! One the University of Illinois students arrived, work began in earnest on laying up earthen bricks. While the building will eventually have earth brick walls, that days work was to focus on support columns. The bricks would be stacked in a particular pattern, and sealed together with an earth slurry. 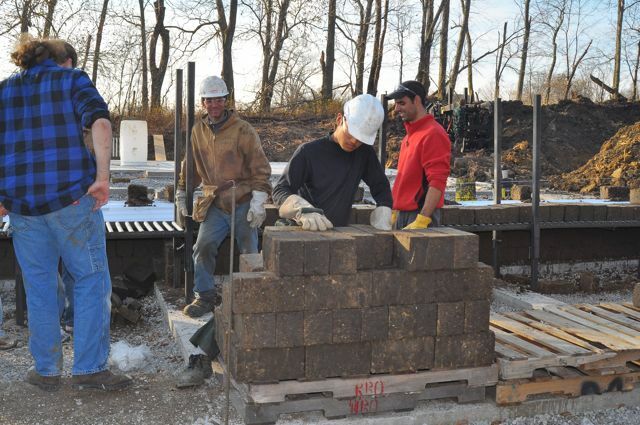 During the “how-to” demonstration, importance was placed on getting the spacing perfect, everything level, and making sure there is a tight bond between the bricks. Most of us formed up in teams of two to work on the columns, while I shot some video footage and got interviews. The participants seemed pretty happy to be working with natural materials. My friend Greg pointed out not just how easy the materials are to work with, but that they are easy on the hands as well. Modern cement and concrete are not just rough, but can actually be corrosive. Of course Greg was covered with mud at this point. Engineering student Kevin quickly commented that he had more real-world, hands-on experience in fifteen minutes after arriving, then he has had in his entire college career. All of the engineering students were very excited to have a chance to create something meaningful, in a very physical way, rather than just put plans on paper for classes. While nosing around the site, I saw a classic VW Beetle, stripped down to the frame, with the engine removed. This peaked my interest, as I have built my own electric car, participated in the developing an open source motor controller, and know that an electric car is on the list of the 50 machines to be designed and open-sourced by the project. Right away, I saw that the tip of the car’s transmission driven shaft was cut short. That’s a common thing to do for a clutch-less EV conversion to be able to couple an electric motor directly to the transmission. VW Bugs are notoriously simple to work on, and have been popular for both hot-rodding and electric vehicle conversions. I can only imagine that this is just the first experimentation working up to the Open Source Electric Car Project. As the sun started dropping lower in the sky, it was time for a meal break; the unusual combination of store-bought pizzas and fresh radishes and other vegetables. By then we had also more or less run out of earth bricks. So, it was time to fire up the brick machine, and keep creating more. The students formed a bucket-brigade to set bricks from the conveyer belt onto pallets for easy transport to the building we were working on. The speed of the machine really impressed me. Dirt went in the top (OK, really, a very much clay subsoil…) a hydraulic ram compressed it in a form, and a brick gets pushed out the front end. The whole machine was fiendishly simple, yet powerful and effective. Since it was all hydraulic, it didn’t even have it’s own power source. Instead, a pair of hoses connected it to one of the open source tractors. Not only are all the components of the Global Village Construction Set open source, they also feature interchangeable parts and inter-operability. It really was a life-size erector set. But instead of just being toys, these machines will be able to create buildings and replicate themselves. Earth Bricks, fresh from the compressor! After the brick compressing session, we finally got the real tour of the place. It was inspiring to hear from the man himself what was going on in the project and the large sense of vision. Besides seeing the buildings and machines, much of the tour was questions about what was next, what was planned, and how the project will proceed. To even the most unusual question, Marcin had a clearly thought out answer. It was obvious how much planning he has put into the entire project concept. As darkness drew near, we decided to drive back home that same night, rather than “waste” the evening with camping and having to pack up the next morning. It was an exciting trip – thoughts of so many possibilities of what can be done to conserve energy, create locally, train people to do for themselves, instead of paying others to do things for them. The whole project sure has it’s work cut out, but if the donations through Kickstarter are any indication, there are a lot of people willing to go to bat for this project!Locally, our Do-it-yourself Energy Group, is considering building some of the machines from the project as a beta site. We already have a homebuilt methane digester, wood gasifier heating machines, and several alternative buildings. Perhaps with an open source tractor and brick compactor, we could really do some work! Does your DIY Energy Group have a website? I’m interested in getting something like that started in my area. That group really doesn’t have it’s own website, but does have some information in the form of videos on the Sustain Jefferson website. Visit the A/V Booth part of the web page for some videos made by the energy group. There is also an e-mail discussion list that you can join there.